Posters at the Squirrel Hill Health Center advertise childbirth classes in Nepalese, warn in Spanish about eating too much sugar and offer words of “welcome” in multiple languages. The center can call on translators who speak 120 tongues. With more than 500 immigrants settling in Allegheny County each year, the health center, established in 2006, has almost 5,000 patients, half of whom speak English as a second language if they speak English at all. Most are Iraqis, Congolese, Somalis, Bosnians, Burmese, Bhutanese and Syrians who fled war zones, hostile regimes or witnessed atrocities. Many spent years in refugee camps. Health and social service workers say many of these new arrivals have a host of mental disorders including post-traumatic stress, and are outpacing manpower and funding to help people heal. “The request we get from these communities is to bring everyone together around mental health,” said Barbara Murock, manager of the Allegheny County Department of Human Services’ Immigrants and Internationals Initiative. Four agencies have resettled the bulk of immigrants in the last seven years. These are a small portion of the 71,000 foreign-born residents of Allegheny County. The largest influx has been of Bhutanese who fled a government purge, most to refugee camps in Nepal. Concentrations in Baldwin Borough, Whitehall and Brentwood prompted the Squirrel Hill Health Center to open a second location in Brentwood in December. The center also operates a mobile unit. “An argument we make to legislators is that it saves money to provide care” because it can prevent more expensive visits to the emergency room, said Susan Kalson, CEO of the Squirrel Hill Health Center. The federal government directly funds the center and five other credentialed health centers in the Pittsburgh area. A national study in 2009 at George Washington University projected the savings in Medicaid insurance per person per year at about $1,500 in today’s dollars. Agencies have been pooling resources to form a network of support tapping immigrant organizations for outreach assistance. Through this network, the Congolese have held sessions on bullying. The Bhutanese organized meditation and yoga practice. Community gardens in Brentwood and Mount Oliver have helped Bhutanese elders — whose cultural references are largely agrarian — regain a sense of place and self. The South Hills Interfaith Ministry’s Prospect Park Family Center mostly serves resettled Bhutanese but was established in Brentwood in the 1990s when the first refugees from the war in the former Yugoslavia began arriving. It houses an office of the Greater Pittsburgh Literacy Council for classes in English, counseling and children’s programs, support groups and a food pantry. Besides language differences, many older Bhutanese are illiterate in their own language, making learning English a double hurdle. Many believe their mental health problems are their fault and beyond their powers to change, said Yadhu Dhital, a recent graduate of the University of Pittsburgh, who grew up in refugee camps in Nepal. An aspiring physician, he served a year-long fellowship with the Allegheny County Department of Human Services, working on models for how people inside the refugee community can be liaisons. The thousands of Bhutanese refugees who settled locally were most urgently concerned with finding work, he said. Mental health issues that were simmering are now boiling. A popular initiative, mental health first aid, trains people within the immigrant communities to recognize symptoms of anxiety, trauma, depression and psychosis so they can call for help or encourage people to get help. Several thousand people have been trained in Western Pennsylvania, said Mary Phan-Gruber, executive director of the Jefferson Regional Foundation. Symptoms show up in a variety of ways. 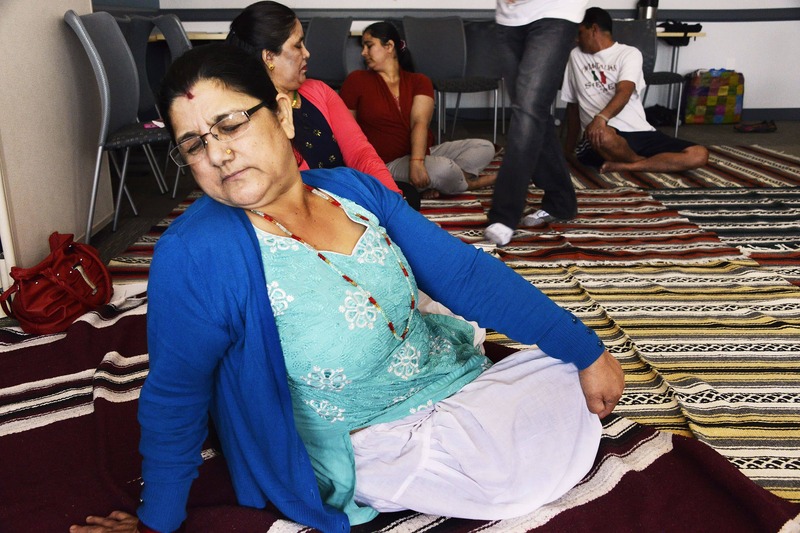 At a recent mental health information session in Brentwood sponsored by the Bhutanese Association of Pittsburgh, he said he has seen more than 200 people in one of these phases. Dr. Thompson has counseled survivors of Hurricane Katrina in 2005, the Murrah Federal Building bombing in Oklahoma City in 1995 and of Flight 427 crash victims in Hopewell in 1994, but he has also treated trauma in a neighborhood setting. “I started my practice in the 1980s in the Bronx, which was decimated as a community, with a lot of violence, displacement, homelessness,” he said. “We saw trauma all the time and began to understand” how nuanced its effects can be.